Cambridge Cable Ties are the perfect choice for your cable management, organizational, or bundling projects. Cambridge products are preferred by Contractors, Manufacturers, Industrial Users, Professionals, Retailers, Businesses, and Personal use. Whether organizing a home office or a project around the house; doing small home renovations or a commercial construction job; merchandising product or hanging banners- Cambridge cable ties offer an easy to use, high quality product that you will be extremely satisfied with. Cambridge products are preferred by industry leaders in the Electrical, HVAC, Plumbing, and Automotive-aftermarket industries. 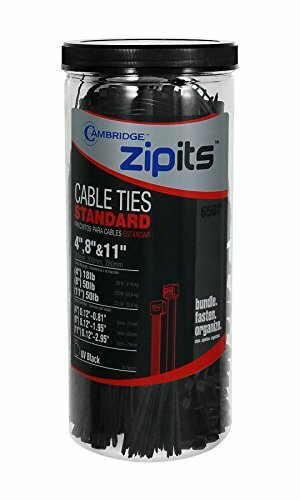 Cambridge ZipIts 650 Pcs UV Black Cable Tie Assortment includes popular sizes: 4" 18 Lb- 300 pcs, 8" 50 Lb- 300 pcs, 11" 50 Lb- 50 pcs. Packed in a convenient reusable storage container. RUGGED DESIGN 4" 18 Lb (Lightweight Duty), 8" 50 Lb (Standard Duty), 11" 50 lb (Standard Duty). 4" bundle diameter: 0.12"-0.81". 8" bundle diameter: 0.12"-1.95". 11" bundle diameter: 0.12"- 2.95". Kit Includes 300 pcs of 4" 18 Lbs, 300 pcs of 8" 50 Lbs, 50 pcs of 11" 50 Lbs. EASY to use and lock quickly and securely around wire bundles, cables, ropes, and more. Packaged in a convenient reusable storage canister. PREMIUM QUALITY for use with cable management, organizational or bundling projects. Whether organizing a home office or a project around the house; doing small home renovations or a commercial construction job; merchandising product, hanging banners, craft, sports or seasonal and holiday ornaments- Cambridge cable ties offer a product solution that you will be extremely satisfied with. CAMBRIDGE Performance driven and high quality products are preferred by industry leaders in the Electrical, HVAC, Automotive Aftermarket, Plumbing and Home Improvement Markets. Looking for another color, size, tensile strength or unit count? Be sure to view all of our Amazon ASINs for a product solution that works best for you.